We used a neon green sleazy hood and green hair extensions for his tail. 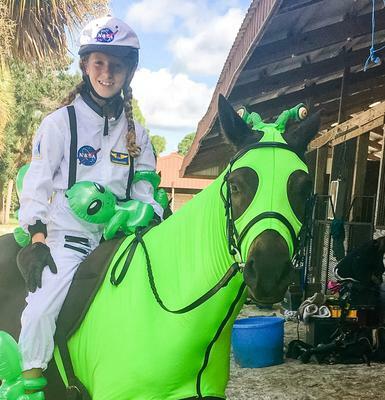 My daughter wore an astronaut outfit with her riding boots and helmet (the NASA cap is glued onto her helmet). 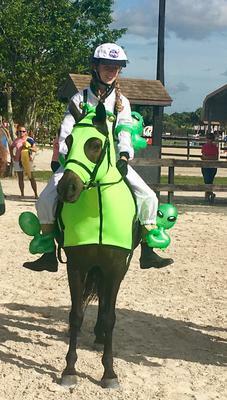 We fitted alien eye tentacles onto his black bridle. Then we used "hugging" alien inflatables as additional attackers! The most expensive part of the costume was the sleazy hood, but that can still be used for its original purpose ($60). The astronaut outfit and alien accessories were around $40. 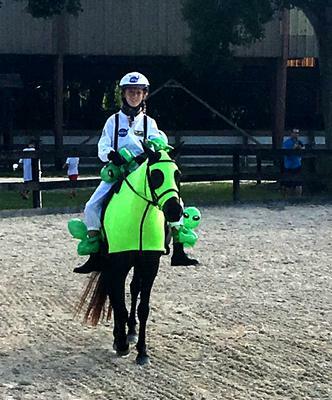 She wore it at a local horse show for their Halloween class. The costume was a hit! They won the grand prize. He didn't mind the costume at all--but we've worked on desensitizing him with plastic bags and balloons. I love it! Not surprised you won your local contest - it's really creative and unique.